Dense Ores Mod makes it possible for you to have texture packs without creating a new texture (although you can create one anyway if you’re not happy with the way it looks). 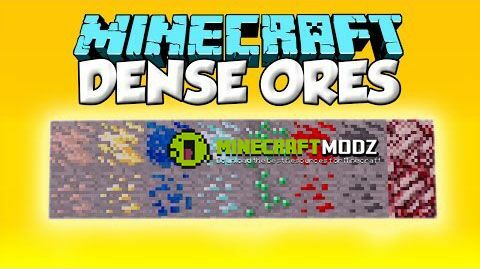 Dense Ores mod adds ‘dense’ versions of ore blocks that will drop 3x the items that regular ore will. It generates about 1-10 dense blocks per chunk (replacing already generated ores). for an overall increase in ores of about 5%. The textures for the dense ores are dynamically generated from the base ores texture and the equivalent ‘stone’ texture. I:renderType – This changes the way the texture generation works. I:retroGenId – Retrogen number. Set it to non-zero to enable retrogen. You can change it to a diffent number to run retrogen again. S:underlyingBlock – The texture of the base block (usually stone or netherrack), see baseBlockTexture.